Judge Sonia Sotomayor's physician has penned a letter proclaiming Barack Obama's Supreme Court nominee to be in "very good health" with few long-term concerns about her Type I diabetes. 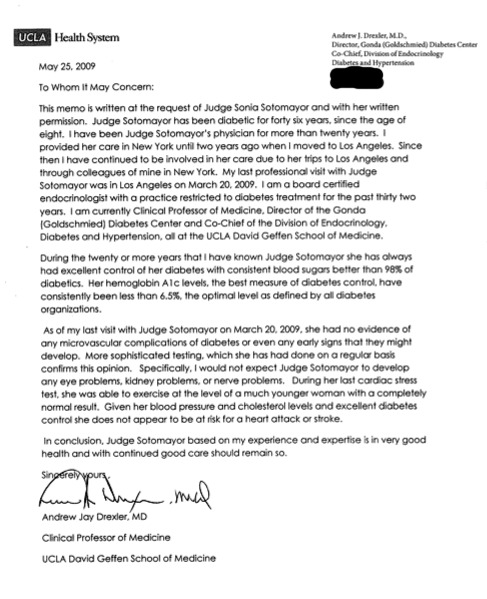 In a letter obtained by the Huffington Post, Dr. Andrew Jay Drexler, a clinical professor of medicine at UCLA, said that during his twenty-plus years serving as Sotomayor's doctor, the court of appeals judge "always had excellent control of her diabetes." "Her hemoglobin A1c levels, the best measure of diabetes control," he wrote, "have consistently been less than 6.5%, the optimal level as defined by all diabetes organizations." "As of my last visit with Judge Sotomayor on March 20, 2009," Drexler wrote, "she had no evidence of any micro vascular complications of diabetes or even any early signs that they might develop. More sophisticated testing, which she has had done on a regular basis, confirms this opinion. Specifically, I would not expect Judge Sotomayor to develop any eye problems, kidney problems, or nerve problems. During her last cardiac stress test, she was able to exercise at the level of a much younger woman with a completely normal result. Given her blood pressure and cholesterol levels and excellent diabetes control she does not appear to be at risk for a heart attack or stroke." The concerns over Sotomayor's diabetes have played a small part of the dialogue surrounding her nomination. While legal observers and political strategists have given the issue a bit more weight, the medical community has cautioned against over-emphasis and even prejudice. While Type I diabetics tend to live, on average, seven to ten years less than those without the disease, a slew of medical advancements have begun to close that gap. Stem cell research, moreover, could pave the way for even greater breakthroughs. That said, senior officials in the Obama administration said they did look closely at Sotomayor's medical history and stressed that, after their review, they felt more than confident in her capacity to serve on the bench. The Drexler letter is, undoubtedly, the next step in putting the issue to rest.